The Canadian version of the TPS-10A was called the TPS-501 - fondly referred to by RCAF personnel as the "Tipsy-501". The TPS-501 was a height finder radar deployed at a number of radar stations which formed the Pinetree Line during the early 1950s. Operated by two personnel, this radar provided the site with an accurate estimate of the height or altitude of an approaching aircraft. The TPS-501 was initially designed as the AN/TPS-10A radar at the Massachussetts Institute of Technology (MIT) during the latter half of World War Two. Early versions of the radar were produced by MIT. 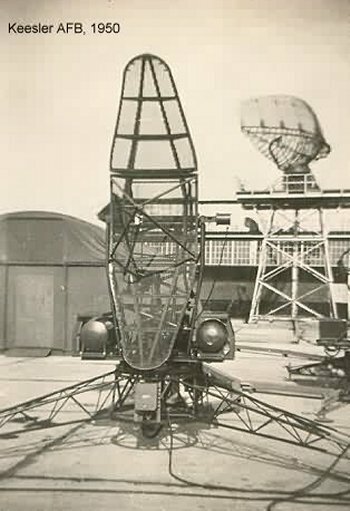 The radar featured a vertically oriented antenna measuring 3 feet in width and 10 feet in height and had an effective range of 60 miles. Excellent view of the AN/TPS-10A height finder radar at Keesler AFB - 1960.